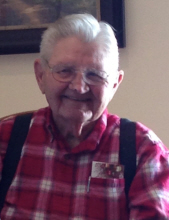 Max Charles Nidiffer, 89-year-old Vinita resident, passed away on Thursday, April 11, 2019 in Diamond, MO at his son’s home. He was born on April 18, 1929 in Afton, to Ray O. and Imogene (Kerr) Nidiffer. After his parents passed away when he was only eleven years old and he was then raised in Whitaker Home Orphanage in Pryor. Max enlisted in the United States Air Force in December of 1946, after serving in the Air Force he re-enlisted in the United States Navy and completed his Military Service in 1953. Max married the love of his life Ruth Mae Rentle on June 12, 1954 at the First Baptist Church in Vinita. She preceded him in death on July 20, 2014. They lived in Miami, Vinita, Merriam, KS, Bluejacket and lastly in Vinita. Max had worked for Vickers in Joplin, Phillips Brothers Construction in Kansas City, and 20 years with Rockwell Aircraft in Tulsa, where he retired from. He also had farmed and raised horses and cattle. He was especially proud of his teams of draft and haflinger horses. Max had rebuilt and worked on his farmall and ford tractors in his later years. He was preceded in death by his parents, wife Ruth, brothers, Bob and Joe Nidiffer, and Gene Hanes. The family includes his children; Curtis Nidiffer and wife Gloria of Diamond, MO, Larry Nidiffer of Pawhuska, Vicki Highsmith and husband Chris of Vinita; a brother, Ben Lord and wife Diana of Carthage, MO; grandchildren, Scot, Justin and Colt Nidiffer, Haley Chenoweth and husband Casey, and Hunter Highsmith; and three great-grandchildren. The family will receive friends from 6-8 PM Sunday, April 14, 2019 at the Burckhalter-Highsmith Funeral Home in Vinita. The graveside service will be held on Monday, April 15, 2019 at 2:00 PM at the Bluejacket Cemetery, with Pastor Kevin Baker officiating. Online condolences may be made at www.highsmithfh.com or on our Facebook page. Arrangements are under the direction of the Burckhalter-Highsmith Funeral and Cremation Services of Vinita. To send flowers or a remembrance gift to the family of Max C. Nidiffer, please visit our Tribute Store. "Email Address" would like to share the life celebration of Max C. Nidiffer. Click on the "link" to go to share a favorite memory or leave a condolence message for the family.